Pro-Palestinian protesters on Monday in Ashdod call for the release of the passengers on the Freedom Flotilla. Free Gaza Movement says it wants to raise awareness of the "illegal siege on Gaza"
UN has describes the blockade of Gaza as "collective punishment"
Israel government spokesman says organizers wanted "wanted violence"
(CNN) -- The deaths of nine people during a raid by Israeli soldiers on a flotilla bringing aid to Palestinians in Gaza has once again brought worldwide attention on Israel's blockade of the area. The Free Gaza Movement, a Cyprus-based human rights group, brought together a number of organizations to form the Freedom Flotilla. The coalition includes the European Campaign to end the siege of Gaza. Another pro-Palestinian group, Insani Yardim Vakfi (IHH), a Turkish organization, also sent a ship. The flotilla left Cyprus on Sunday and had been due to arrive in Gaza on Monday. 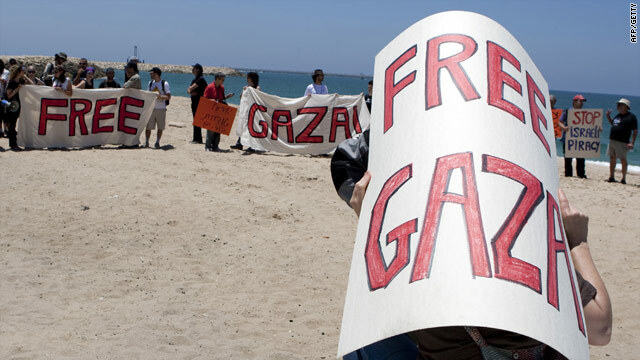 The Free Gaza Movement says it wants to raise awareness of what it describes as the "illegal siege on Gaza" by Israel. It says the blockade of Gaza by Israel is unjustified and that it denies Palestinians vital goods and services. "We want to raise international awareness about the prison-like closure of Gaza and pressure the international community to review its sanctions policy and end its support for continued Israeli occupation," the group says on its Web site. What does the convoy consist of? Six ships -- three passenger and three cargo vessels -- carrying over 10,000 tons of aid and 600 passengers from more than 20 countries, says the Free Gaza Movement. Most of the passengers were Turkish. The cargo consists of food, medical aid and other supplies including cement, prefabricated housing and educational equipment, the group said. The Turkish prime minister said Monday that the vessels were inspected before they left port in Turkey to make sure the cargo did not include weapons. What does Israel say about the blockade? The blockade was imposed by Israel in 2007 after the militant group Hamas seized control of the territory. It is designed to stop the smuggling of arms into Gaza, the Israeli government says. Israel says the Gaza shoreline is closed to maritime traffic. Israeli government spokesman Mark Regev said Israeli civilians were plagued a year ago by rockets and missiles fired from Gaza that originated in places like Iran and Syria. What does the U.N. say about the blockade? The U.N. has described the blockade of Gaza by Israel as the "collective punishment" of the Palestinian people living there. The United Nations has repeatedly criticized the blockade and the insufficient flow of materials into the area for basic needs and reconstruction. Secretary-General Ban Ki-moon has warned the closure "creates unacceptable suffering, hurts forces of moderation and empowers extremists." What goods does Israel allow into Gaza? About 15,000 tons of humanitarian aid flows into Gaza each week, Israeli government spokesman Mark Regev said. Israel says it allows enough humanitarian aid -- including food and medicines - into Gaza for the people who live there and that the blockade is designed to stop Hamas from building or acquiring arms. Israel has never published a list of banned items but it has refused to allow into Gaza books, paper, blankets and reconstruction materials. The U.N. says 80 percent of Gazans rely on some form of humanitarian aid. Why did Israel object to the flotilla? The Israeli government described the flotilla has a "provocation" and said it was a political stunt. Danny Ayalon, the Israeli Deputy Foreign Minister, said: "The organizers' intent was violent, their method was violent and the results were unfortunately violent." The Free Gaza Movement said the flotilla's aim was to "challenge Israel's blockade of 1.5 million Palestinians trapped in an open-air prison." Was there another route for this aid? The Israel government says its soldiers faced violent resistance as they boarded the largest ship, the Marmara. The Free Gaza Movement denies there was violent resistance to Israeli soldiers, saying the soldiers immediately opened fire on unarmed civilians. Video released by the Israeli Defense Forces showed intense fighting on the decks of the ship. The ships were escorted to the Israeli port of Ashdod and 15 people who had been aboard were taken to an Israeli prison in Beer Sheva, according to a spokesman for the Israeli prison authority. Meanwhile diplomatic tensions rise. Turkey recalled its ambassador to Israel, there was widespread international condemnation of the Israeli operation and the U.N. Security Council met Monday. Have ships been sent to Gaza during the blockade before? Yes, the Free Gaza Movement on its website says it has organized eight voyages to Gaza, "successfully arriving in Gaza five times." The group said its "boats are the first international ships to sail to the Gaza Strip since 1967."